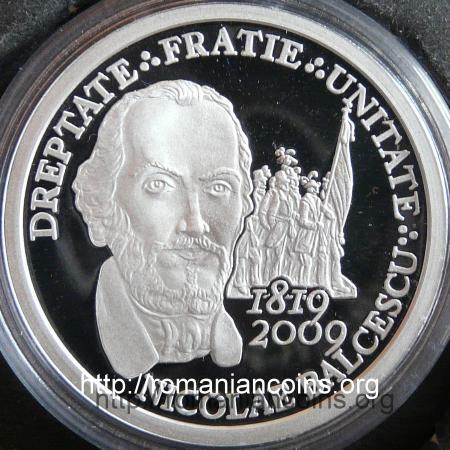 Obverse: Romanian coat of arms, face value 1 LEU and, inside a laurel wreath, the painting "Revolutionary Romania" of painter Constantin David Rosenthal Reverse: portrait of Nicolae Bălcescu (painted by Gheorghe Tattarescu), part of an aquarelle made by Costache Petrescu, picturing a group of revolutionaries, years 1819 and 2009, inscriptions "DREPTATE FRATIE UNITATE" meaning "RIGHTEOUSNESS BROTHERHOOD UNITY" and "NICOLAE BALCESCU"
Obverse: Romanian coat of arms, face value 10 LEI and, inside a laurel wreath, the painting "Revolutionary Romania" of painter Constantin David Rosenthal Reverse: portrait of Nicolae Bălcescu (painted by Gheorghe Tattarescu), part of an aquarelle made by Costache Petrescu, picturing a group of revolutionaries, years 1819 and 2009, inscriptions "DREPTATE FRATIE UNITATE" meaning "RIGHTEOUSNESS BROTHERHOOD UNITY" and "NICOLAE BALCESCU"
Obverse: Romanian coat of arms, face value 500 LEI and, inside a laurel wreath, the painting "Revolutionary Romania" of painter Constantin David Rosenthal Reverse: portrait of Nicolae Bălcescu (painted by Gheorghe Tattarescu), part of an aquarelle made by Costache Petrescu, picturing a group of revolutionaries, years 1819 and 2009, inscriptions "DREPTATE FRATIE UNITATE" meaning "RIGHTEOUSNESS BROTHERHOOD UNITY" and "NICOLAE BALCESCU"
This is the first Romanian anniversary coin without inscription ROMANIA. 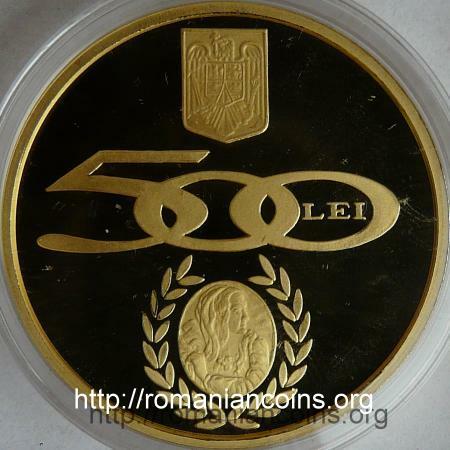 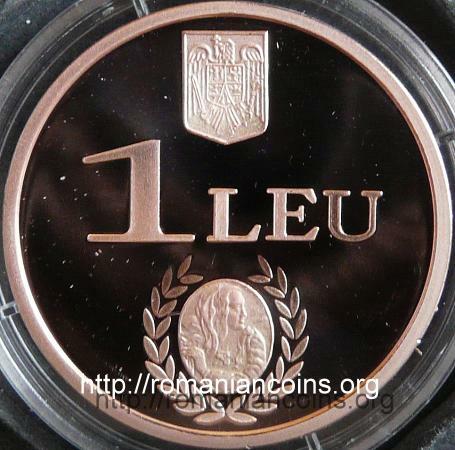 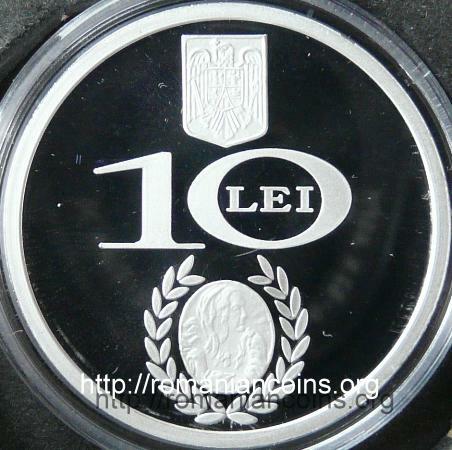 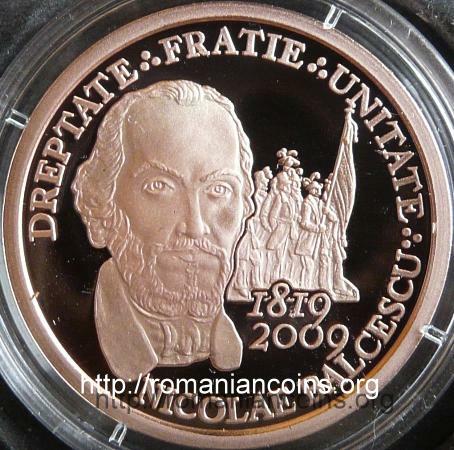 The presence of the masonic sign ∴ on the coin is a remembrance that Nicolae Bălcescu was mason. 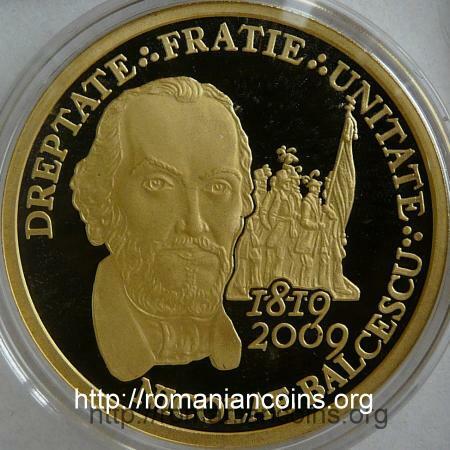 One of the lodges established in Romania after 1989 was named Bălcescu.